Last Friday's Special Persons Day was lovely (and hot!) from start to finish.Thank you to Renee DeWeese (Moran) for the awesome choreography each of our classes learned and performed for all of us.Another thank you to our dedicated 8th grade parents for coordinating the catered lunch and set-up for the event. 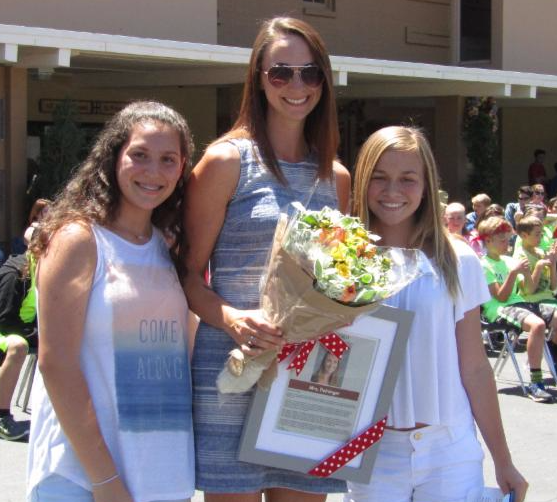 It was wonderful to celebrate with our 8th graders, and we were all excited to congratulate Mrs. Natalie Deininger as the yearbook dedicatee. I am so pleased to announce thatMrs.Kelli Bacherhas accepted ourSchool Counselorposition. Kelli has over 13 years of school counseling experience, workng with children of all ages in her various roles as Social Worker, Special Education Counselor, school counselor, and parent volunteer.She has planned, developed, and run numerous programs for student support and parent education.Kelli has also volunteered her time for Ability Awareness presentations in the Moraga School District, where her children go to school.She is very excited to join our St. Perpetua school community! Another exciting announcement to share is thatMs. Kathleen Radeckehas accepted the position of theOakland Diocese School Superintendent.As many of you know, Kathleen was our St. Perpetua Principal before my arrival.She has over 30 year of Catholic school administration experience, and she is currently wrapping up her responsibilities with the Diocese of Monterey.Her energy and passion for Catholic education will benefit all of our Diocese schools! 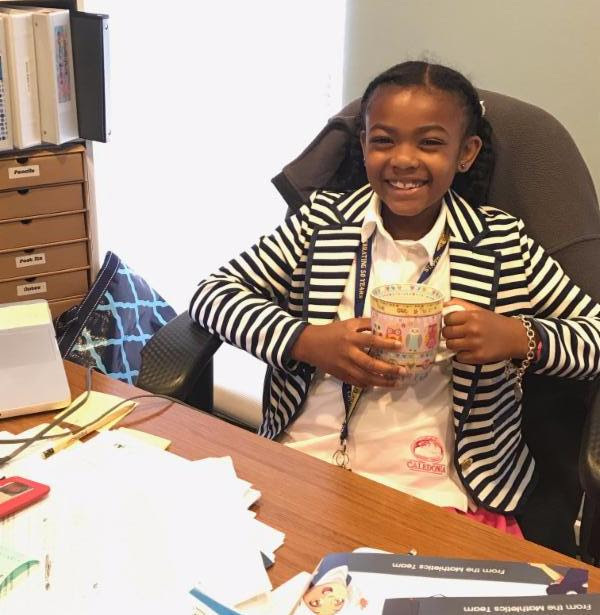 Good Afternoon from Principal Lola!I have had a very fun day being your principal.I checked in with our TK and Kindergarten students and helped them with their recess.I also got to go to a meeting about our exciting new community center!I had a special lunch with Mrs. Goodshaw and then I got to be the office helper for our monthly fire drill, which was noisy but exciting.Being Principal for the Day is lots of fun! My favorite thing to do at St. Perpetua is to learn math.All the St. Perpetua teachers are amazing, and my classmates are nice, too!I like to go to Panther House in the afternoon and play with the jump ropes. and the Christian lives a faith centred on hope. just as GoodFridayhas passed to Easter and beyond. reflected in the new life springing up around us. both to this world and to our hearts and lives. Our2017 yearbooksare here!If you would like to purchase a yearbook for your student,please send your cash or check ($35 per book) into the office.8th grade students will receive their yearbook (cost covered by graduation fee) onWednesday, 5/31.All other students who purchase a yearbook will receive their book onWednesday, 6/7.We have alimited quantity, so be sure to send in your cash or check if you'd like to reserve a book! 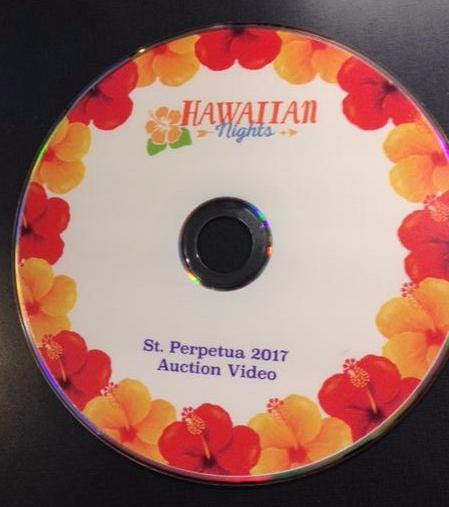 TheDVDshown at our March 'Hawaiian Nights' fundraiser auction is coming home with your youngest child today.This DVD is a wonderful '2016-17 look-back' at each grade, and it's a treasured gift for you! We are offering an informal'Uniform Swap'for parents.Parents can bring in outgrown uniform clothing and hopefully find new sizes for their growing children!A 'Swap Box' will be located in thePerpetua Room. We have flyers for varioussummer camp opportunitiesin the office.Feel free to stop by the office if you are looking for summer activities for your children. Our final Scrip order for the school year is this week!Place your orders byMAY 28thand you can pick up your order on Friday, May 2nd. We willNOThave Scrip ordering over the summer break. Place your online orders atwww.shopwithscrip.comwebsite. You can pay by Prestopay, check or credit when you pick up your order.When possible, please help us reduce credit card fees by paying via check. 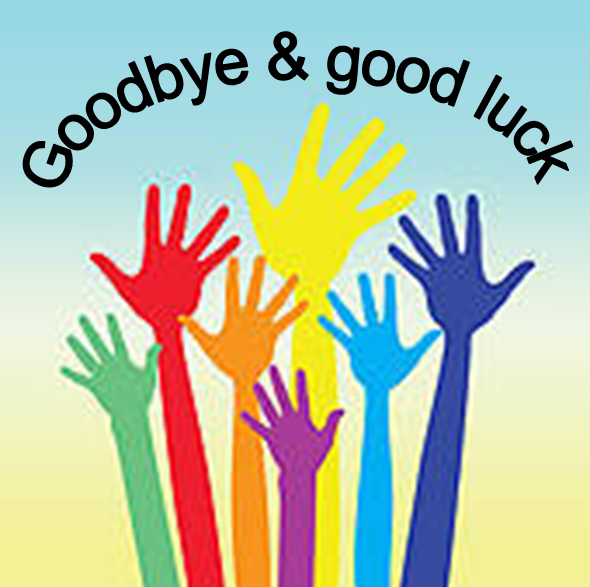 It is in keeping with tradition that the St. Perpetua community likes to say goodbye and show our appreciation to our departing teachers by giving them a cash gift.Please consider contributing to this fund.Cash or check (please make out to St. Perpetua School and write 'teacher goodbye' in memo line).Please bringFarewell Gift formto the office byMonday, June 6th, indicating your gift distribution. We will be celebrating these teachers at the end-of-the-year mass onFriday, June 9th.Please join us at mass to show your support for them. At that time they will receive the cash gift and flowers. St. Perpetua's 2016-2017 Mathletics Awards! Mathleticsis the online practice program we utilize for our students in 2nd - 8th grade.We proudly announce some awesome accomplishmentsfor the 2016-2017 school year, reported by the Mathletics site.Congratulations to all of our students and teachersfor all their hard work, improvements, and accomplishments! Order your packaged school supplies throughSchool Tool Box!You can order online and it will be sent directly to your home.Go towww.schooltoolbox.comto order and customize your school supply list.See theflyerfor more information.Deadline for orders isAugust 1st! School Toolbox is anoptional program.If you would like to purchase your own supplies, you can find the class supply listshereon the school website in the 'forms & documents' section. Please join usthis Fridayfor thelast Cafe Perpetua of the school year! !We look forward to seeing you!Thank you for supporting your children's Garden of Learning. Wondering what to do with all those books you boxed during Spring Cleaning? Donate them to the annual Book Swap. This is a free and easy way for your student(s) to stock up on books to read, during Summer Break. Our goal is 100% participation. 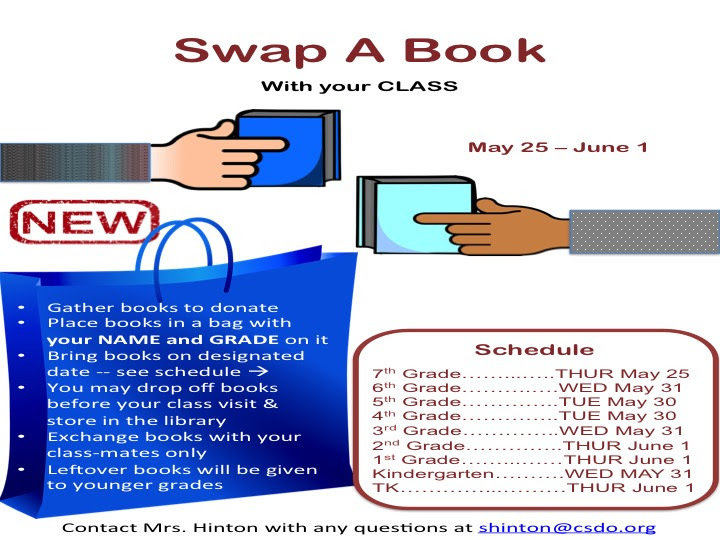 Book Swap is a great way to exchange all those scholastic books you've ordered that your child does not wish to keep. How does it work? On the day of your child's book swap, s/he brings a bag of books that s/he no longer wants to keep. Every student in the class brings books to donate. All the donated books are set out on our library tables. Then, the students get to "go shopping". Each student gets to take the same number of books that s/he donated. Remember, your students is only swapping books with class mates. After everyone has taken all the books that s/he wants, the left-over books are donated to the next class book swap. at the OrindaCountry Club.Proceeds from this event fund new technology purchases for our students!Sign uphere.Register byJune 11thand you receive a 10% discount! Do you enjoy organizing things? Do you find the library to be a relaxing, peaceful refuge from your busy life? Then, this may be the job for you. We are looking for afew volunteers to do Shelf Maintenance, next school year. 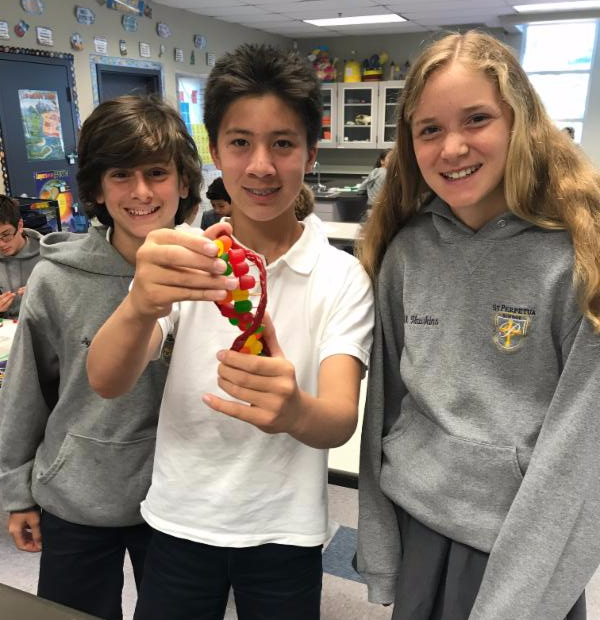 7th grade made candy DNA models in Science this week! 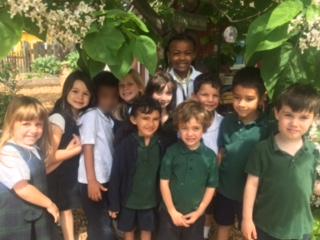 Principal Lola was TK's Garden Teacher today! Here are some May enrichment events sponsored by SEEDs! More info will be available in August 2017, but interested students may contact Ms. Schwarck athschwarck@csdo.orgwith any questions in the meantime. Don't forget yourJune calendars, especially if you expect changes from your regular routine. You can always email me atlkenney@csdo.orgwith changes. Since June is such a short month, we will be combing the May and June Panther House early morning/ after school charges into one billing cycle. That means you will have no charges in June, but itwill show up in the July statement. As you begin to shift your attention to the fun of summer, and purchasing new sports equipment or action toys, please think about donating softly warm items to Panther House for use next year. Things like bikes, scooters, and balls would be greatly appreciated. Don't forget to check out some of the summer camps being offered by our current after school class providers, Cooking Around the world and Sarah Science. You can find brochures, along with others, in the office.